The Konkani Samaj of Gujarat from the North, South & West i.e. Ahemadabad, Baroda and Surat, refered as “G3” had their Annual Meet and Satyanarayan Pooja, this year at Surat. It is organised in turns by the the Konkani Bandhav from these three cities. Compared to Ahemadabad and Baroda only a handful of our Samaj Bandhavs reside in Surat, inspite of their miniscule number (approximately only 15 families) they managed to organise the event in a grand manner, which was held on Sunday, 26th January 2014. This year the Surat bandhavs wanted do something different and bring in some “Devine Atmosphere” into their event, which had never happened in past 18 years, so they invited our Balaji Seva Samiti, Vasai Roads “Sri Venkataramana Bhajana Mandali” to render a bhajan seva. Their invitation was accepted and a trip to Surat was organised by our Secretary Sri Purushotham Shenoy. 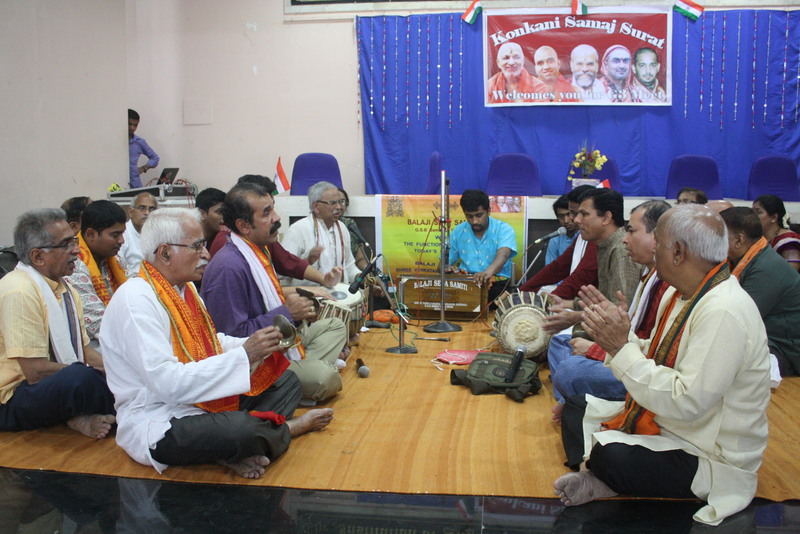 It was a proud moment for Surat residents as it was the first time in 18 years a “Bhajan Seva” was organised in their event. It was made possible by Sri Hosmat Gurudatt Shenoy and Smt Sumati Gurudatt Shenoy a very active members of Surat Samaj and other committee members. Vijayendra Prabhu, M V Bhaktha & Satyendra Nayak on Taal. Following is the list of bhajans…. The entire event was captured beautifully on Photo and Video by our very own official photo & videographers, Lekshmana Rao and Madhusudan Prabhu. We thank them for their wonderful dedicated work. Their contribution has enabled thousands of viewers, residents and non residents to enjoy the event. Congratulations to Balaji Seva Samiti for organising the tour to Surat on 26th Jan 2014 on the occasion of G3 Meet of Ahmedabad Baroda and Surat GSB Mandals. My Special thanks to Mr. Purushotham Shenoy who had taken pain and worked hard whole heartedly and dedicated his full energy for organising this Surat tour and making it a grand success. Also sinere thanks to Mr.M. Vivekanand Bhakta for his full support and uploading the events on this site and other team members too. Mr. Lekshman Rao our great official photographer has captured this precious moment on his camera very effectivly through out from Vasai Road-Surat-Vasai Road. Kudos to Mr. Lekshman Rao. May Lord Balaji bless you all and shower his choicest blessing on you. Thank you Madhu for your lovely company and also video graphing the event, and also thank you for these lovely motivating comments.